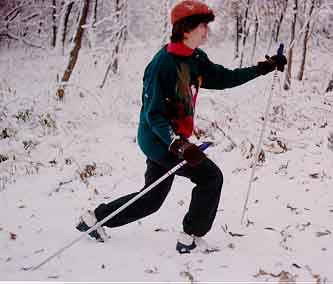 The telemark position is used to secure forward-aft stability when skiing over terrain with sharp transitions. The lead leg can also be steered, resulting in the telemark turn. The positioning entails thrusting the lead leg forward in a bent fashion with the trailing leg also bent but in a kneeling position. Hands are to the side for balance and polling.